guy in cap is LUCAS!! 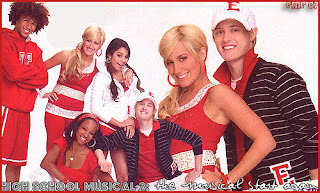 CORBIN is guy with red sweater, blondie is ASHLEY, girl in white is Vennessa, girl wit red hair band is monique. i came to realise how cute he was!! Cynthia thomas and i was like keep on talking bout the show. Lucky she like wan is Corbin Bleu. haha, or else we will kill each other man. Sadly, no one is interested in Zac Efron. Even my youger brother also say he prefers Lucas than Zac. HIGH SCHOOL MUSICAL 2 ROCKS! !